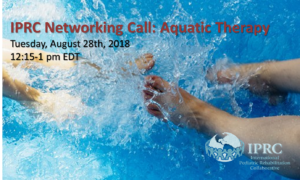 The IPRC Outcomes & Best Practices Committee is hosted a networking/discussion event on August 28th, 2018 to discusses ideas, strategies, and clinical rationale for use of Aquatics in the Pediatric Population. What population(s) have you experienced the most success with this treatment medium? What populations have been been most challenging? What is the clinical rationale used for selecting aquatics vs. land based therapy? How do you determine frequency for aquatic therapy? What are the determining factors? Strategies used to define an episode of care? What special considerations/inclusion/exclusion criterion for aquatic therapy are used at your organization? What disciplines hold treatment sessions in the pool? Co-treats? Group sessions? How do you engage family members/caregivers in aquatic therapy sessions? Is there any special documentation used for these sessions?